Choosing how to remove nose hair is a bit trickier than other areas. The hair in the nose acts as an air filter, the skin inside the nose is delicate and can be hard to reach. Having a filter is all the more important if living in an area with a lot of pollution if you’re a smoker or have asthma. The nasal passages and lungs really appreciate fewer toxins. While there may not be as much of a filter by cutting half of it off, by leaving some it can still serve part of its purpose. A good pair of facial hair scissors are much more efficient and safer than pulling out any old scissors in your drawer. These are small enough to trim the hair you want without risking nicks and cuts as the ends are rounded for safety. However, they’re too big to trim hair inside the majority of the nose. Just clean between uses and pull out to groom other areas like the brows, mustache and outer ears. 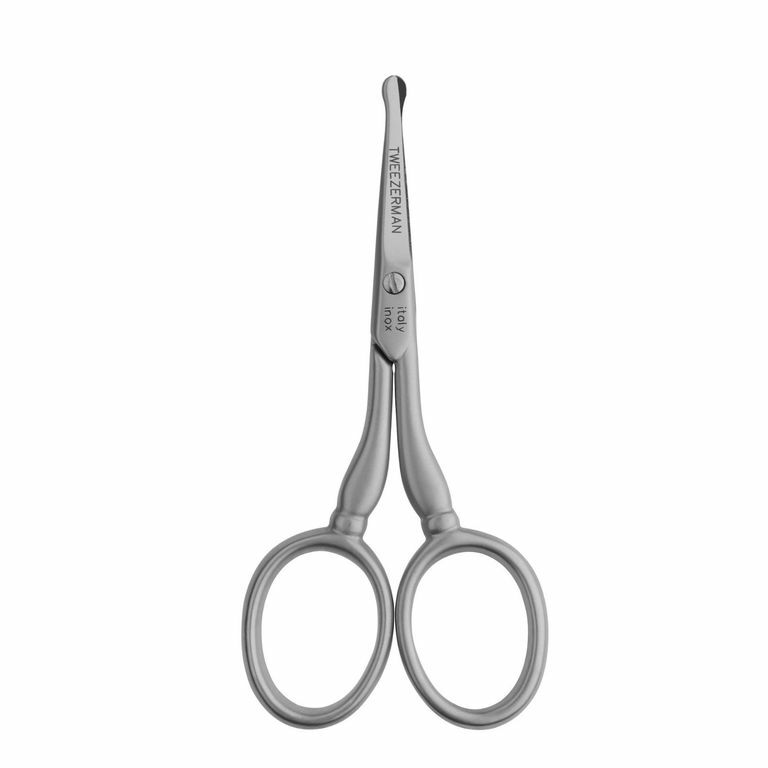 Two highly rated that cut through coarse hair and don’t have many complaints pulling are Tweezerman Spa Facial Hair Scissors shown left (compare prices on Amazon) and Rubis Switzerland Ear/Nose Hair Scissors (compare prices on Amazon). Some people just get the outer portion of the nose waxed which is much safer and less invasive than getting what others choose- the inside of their nose waxed. The inside is removed by forming a ball of hard wax on the end of an applicator stick, letting it cool somewhat and then placing it inside, not going farther than the ball of the nose. It’s left in for more than a couple minutes and pulled out. Some salons and spas offer a full nose wax, while others might just be willing to do the edges. If going to the pros, seek out a reputable salon and a salon that has much skill and experience. This does keep the hair away a lot longer because it’s removed from the root. But remember that you have taken away most of your filter, and there is much more chance of irritation and ingrown hair. For home, follow directions from the manufacturer for cleaning up the edges. Looking for the full nose wax? Nad’s has a kit to do just that (read review). Like waxing it removes hair from the root- but one at a time. Ouch! People that have tweezed their nose hair say that waxing it is much less painful. Honestly, I wouldn’t recommend tweezing. But if you do, I’d just remove noticeable outside hair by using a quality pair, like Tweezerman Slant. Clean tweezers with an alcohol wipe before and after using. Hard wax is used for inside the nose. Sugaring, either in its paste or gel form is much too pliable to be put inside the nose. However, it can be used to remove the hair on the outer edges. It’s much gentler than waxing because it doesn’t stick as much to the skin. Most people experience less pain and don't don't end up with as much redness or irritation.